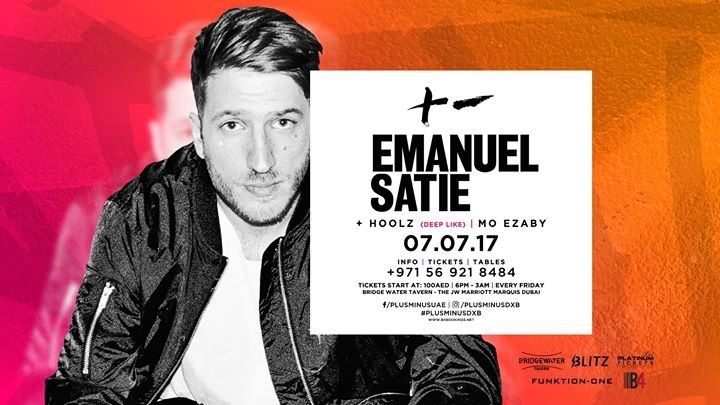 After an epic launch party we take it up a notch with our July opener Emanuel Satie. Emanuel Satie is a producer and live act based in Berlin/Germany. His music is released on labels such as Saved Records, Knee Deep In Sound and Get Physical. July 7th #PlusMinus Summer Sessions at @BridgeWater DXB. 6 – 9pm FREE ENTRY for everyone and food offering. Men gets 5 beers or soft drinks + a starter & main course for AED275.